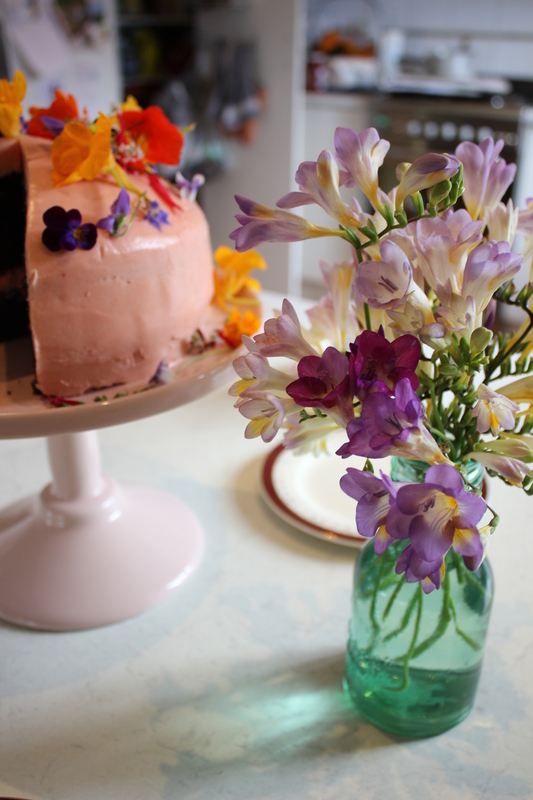 So when I stumbled across some gorgeous edible flowers at Leichhardt organic markets, I bought them on impulse. They were from Darling Mills Farm (which is quite possibly the cutest name ever) and I was super happy with them. I found some fantastic produce at the markets, and, as usual, Instagrammed them. Preheat your oven to 160C and grease two 8 inch sandwich tins. I also placed a circle of baking paper at the bottom of each of my sandwich tins, just to be on the safe side. 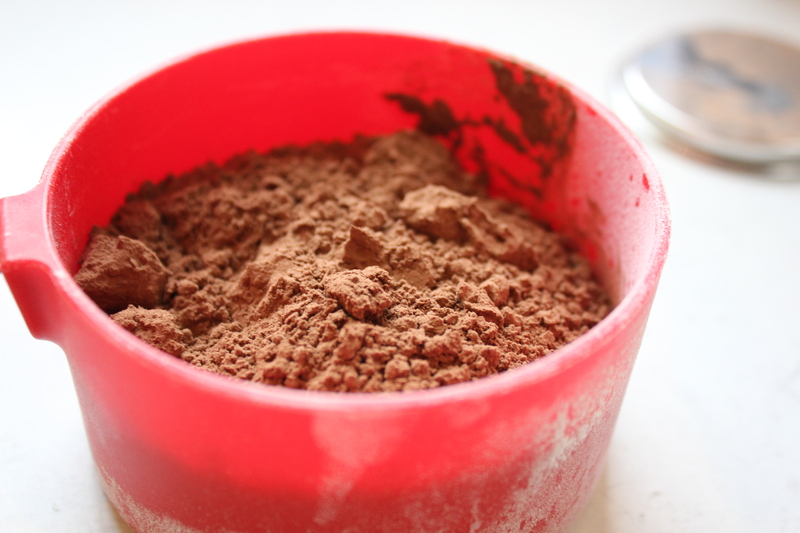 Sift all of your dry ingredients together – the flour, sugar, cocoa and bicarb – until they’re well mixed. Add in your vanilla and the eggs, mixing until both eggs have combined. Brew a strong cup of coffee (I used two teaspoons of instant coffee in one cup of boiling water) and add it to the mixture as well. Pour in the milk, and finally the canola oil. The oil replaces butter in this recipe and makes it nice and moist, but it may take some perseverance to mix it in properly. 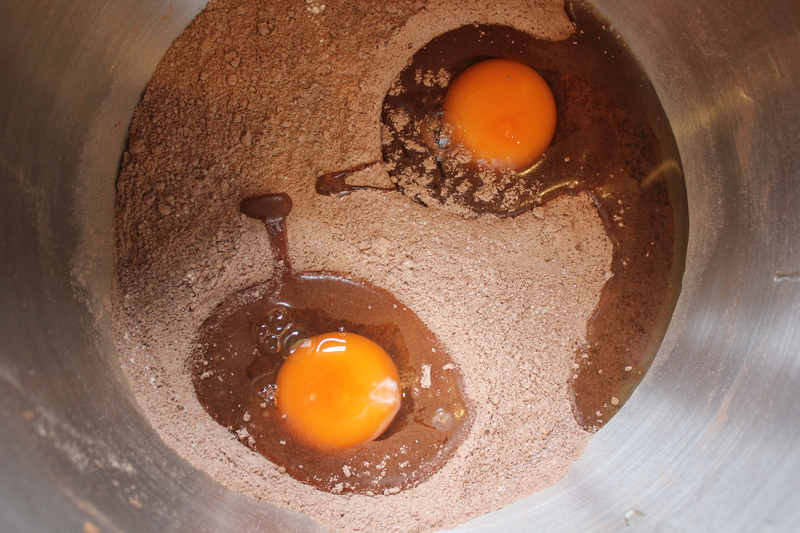 The oil will want to sit on the top of the mixture, so you need to mix it well and disperse it throughout. The mixture will be very runny, but don’t worry. Pour it evenly between your two tins and put them in the oven for 30-35 minutes. If possible, keep them on the same shelf of the oven and rotate them at 15 minutes so that they cook evenly. They’re ready when a skewer inserted in the middle comes out clean. 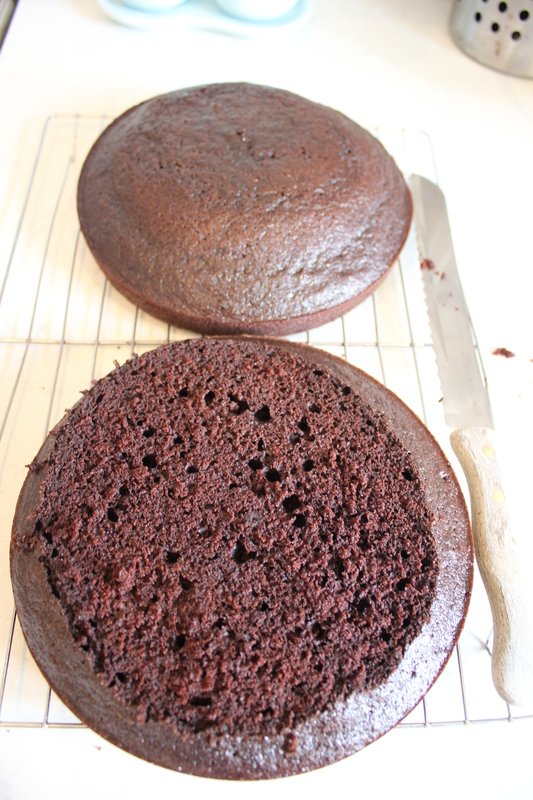 One of your two cakes will most likely be a nice shape than the other. Pick the one that is slightly dodgier, and slice off the first centimetre or so with a bread knife so that you have a flat cake. Using a palette knife, spread a thin layer of buttercream icing in the top of your now flat cake and place the second cake on top of it. 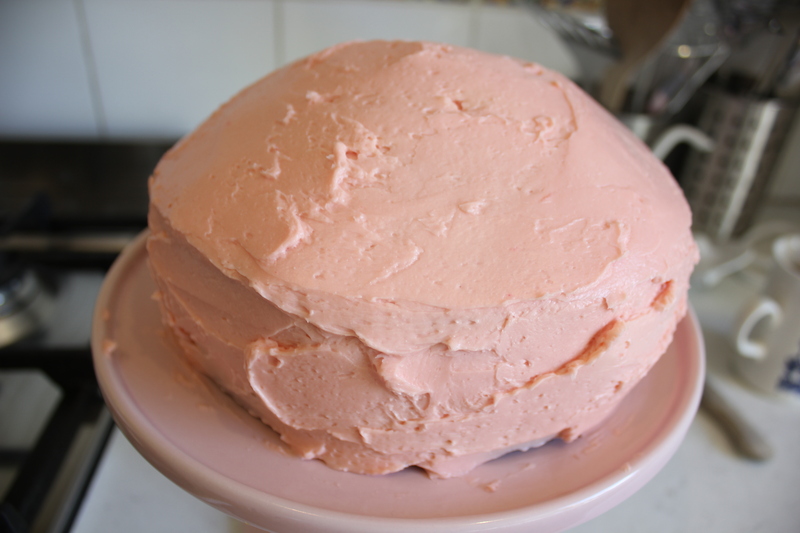 Spread the rest of the icing over the two cakes as smoothly as you can. If you can’t get the icing as smooth as you’d like, grab a cup of hot water and dip your palette knife in it for a few seconds. Take the warmed palette knife and run it back over the icing, dipping it back in the hot water regularly, this will give it a really smooth finish. 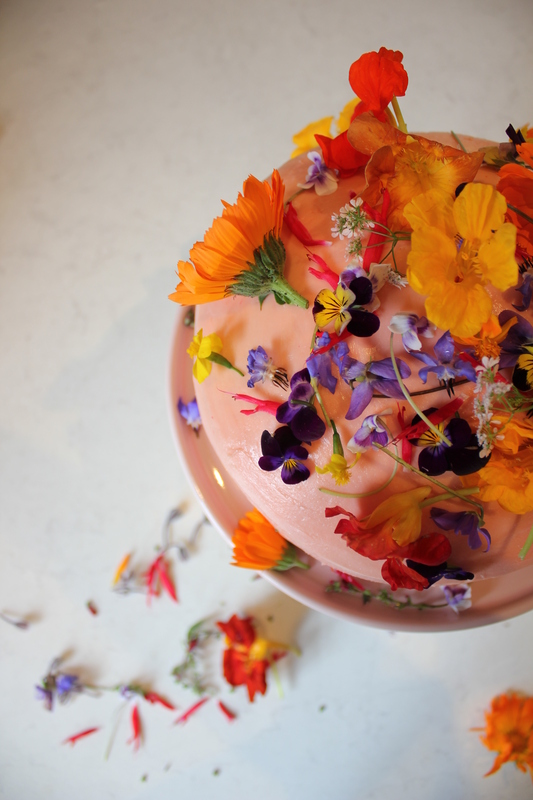 Top your cake with whatever edible flowers you have and serve. This cake is wow-worthy, serve it up for a special occasion. 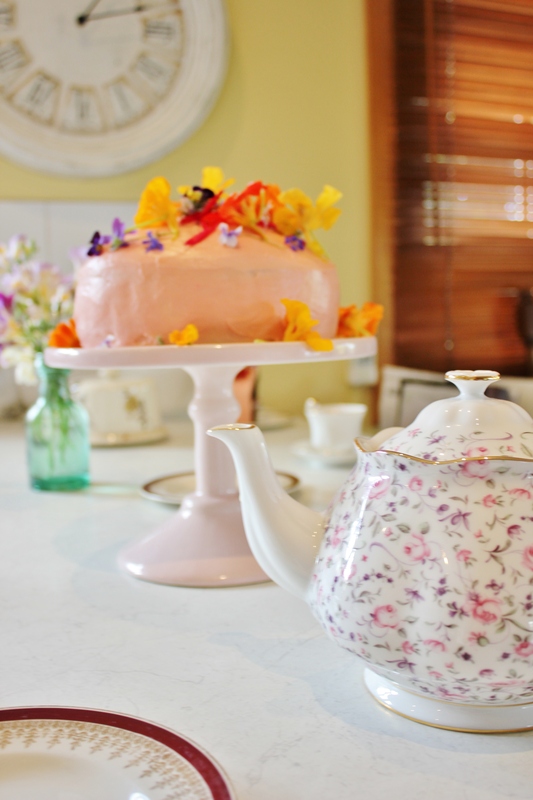 And don’t be afraid to try the flowers, they’re a lovely addition! So pretty!! 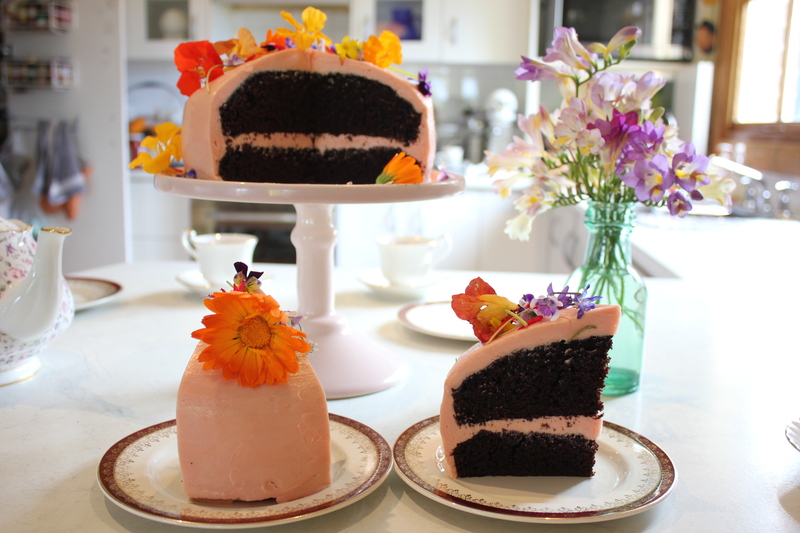 Chocolate cake is my favorite and adding the lovely flowers makes for a beautiful presentation. Thankyou! I had so much fun making it! Oh, I just LOVE LOVE chocolate! Me too! It’s a serious weakness of mine! Gab, the flowers are beautiful and colourful and made for amazing decorations! the cake has been so beauitfully presented and i enjoyed the read! Hope to come scouting markets with u when im home! 🙂 keep up the great cooking, blogs and photography! Thanks Elise! It was so much fun to make as well! Market scouting is great fun! 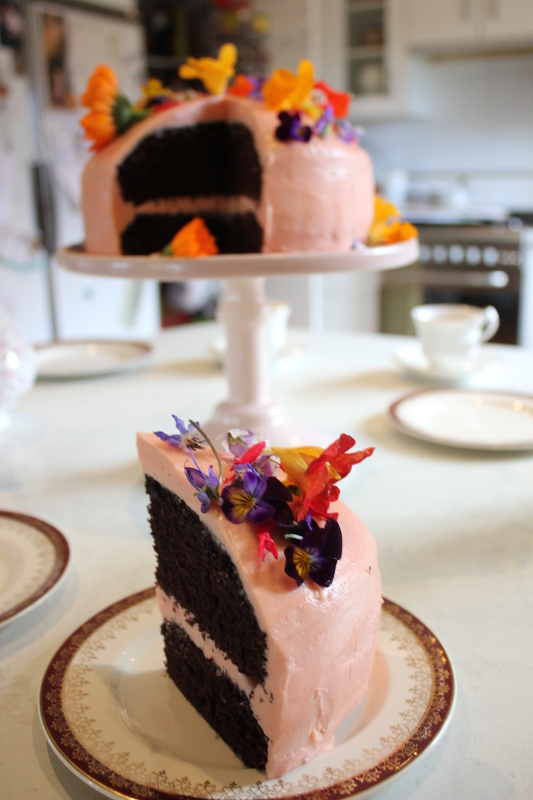 I love the colour of the icing against the rich brown of the cake! Looks lovely. Thankyou for the lovely words! Your creations look lovely as well!